It's like a Friday afternoon. Only better, because it's three fifteen and I've been home for FOUR hours. Granted, my mom thinks I should be medicated and on the couch knocked out by Nyquil, but I'm full of energy. Sniffly, yes, but energetic. And with hands that have been washed far too many times today. But that's what let's me bake. Well, I guess not exactly, but it's how I keep from worrying about killing anyone. Or at least giving them a cold. If I feel a sneeze coming, I run out of the kitchen. So far, this plan is working. I hope. Today I baked with levkar for the first time. And the brownies turned out surprisingly moist, not unlike butter-laden brownies. Preheat oven to 350ºF. Line a 9x13 inch pan with foil (optional) and butter. Set aside. Add the eggs one at a time, allowing the first to be incorporated before adding the second. Beat in the egg yolk and vanilla. With a spoon or spatula, stir in the chocolate chips and chopped kumquats (if using). Stir in flour mixture until just incorporated. Spoon batter into prepared pan, spreading gently to corners. Bake for 40-45 minutes or until the top is light brown and toothpick or tester comes out with a few moist crumbs attached. Set the pan on a rack to cool for at least 30 minutes. 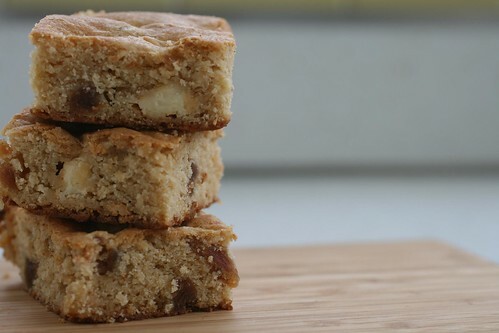 Cut blondies into 24 pieces. Serve immediately or let cool completely before storing. Store at room temperature for up to 3 days, or frozen for up to 3 months.